In his hand is the life of every creature and the breath of every human life. (Job 12:10) These words follow a declaration by Job that even the animals know that God is the Creator and never lets go of them and us. These words settled on my heart as we left Ol Pejeta Wildlife Park on Tuesday. Like every day, I was reflecting on what one thing God might have for me in the day’s experience. This was the one day in our trip that we designated as our holiday. We were picked up at 6:00 a.m., before sunrise, by our guide, Peter. We rode about 20 minutes to the entrance to the park, and with the sun rising over Mt Kenya our safari began. For the next ten hours (with a stop for lunch), we rode through this 125,000 acre park looking for wild animals. It is always an amazing experience to ride in an open sided Land Cruiser, stopping within feet of animals that could easily put an end to our lives (a pride of 16 lions, for example, resting beneath a tree not more than a dozen yards in front of us). It became a message about God’s peaceable kingdom when neither human nor beast feels threatened. I began reflecting on the greater message of good and evil from human hands. From God’s hand comes life and goodness, and when we fully reflect the image of God that’s what comes forth from us. But we humans have the ability to choose what is evil when we focus on what seems best for us. That message came to me in two stops, both pictured here. 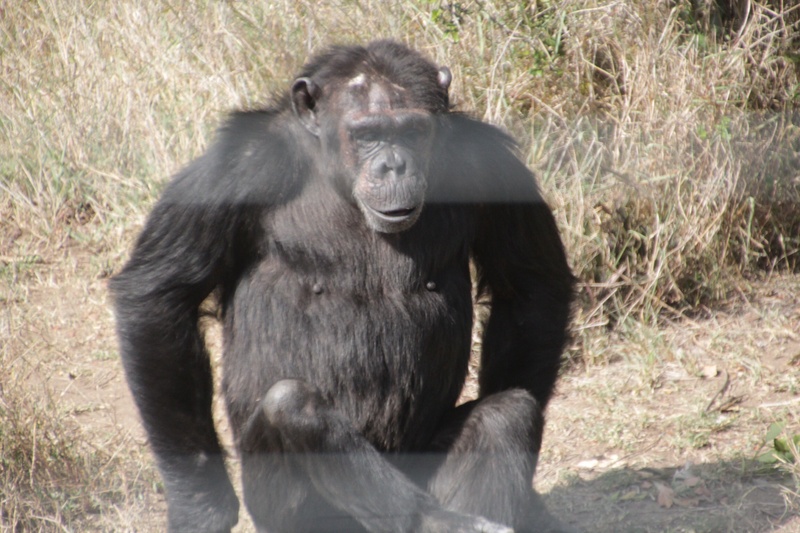 Chimpanzees are not native to Kenya, but within the park a large chimpanzee rescue has been constructed to continue the work of Jane Goodall. Chimpanzees are an endangered species, their greatest threat is humans. Our guide told us that there are more chimpanzees in captivity around the world than in the wild. Their habitat has been destroyed for human use. Many have been taken as pets (which rarely ends well) and hunted as food. What God has created, humans have destroyed – intentionally and unintentionally. But now there is this effort (not without controversy since chimpanzees are not indigenous to Kenya) to care for chimps that have been mistreated and injured. Humans are caring for the wounded creatures by providing a haven of security. One of the frustrations for visitors is that it is difficult to see the chimpanzees – but then, the refuge is not for our benefit but the chimpanzees. There is a small viewing area in which is it only possible to see a chimpanzee if it happens to come close to the viewing area. We were fortunate to see three of them in our visit. And then there was Baraka (the swahili word for blessing). He is a ten-year old black rhinoceros that is blind. 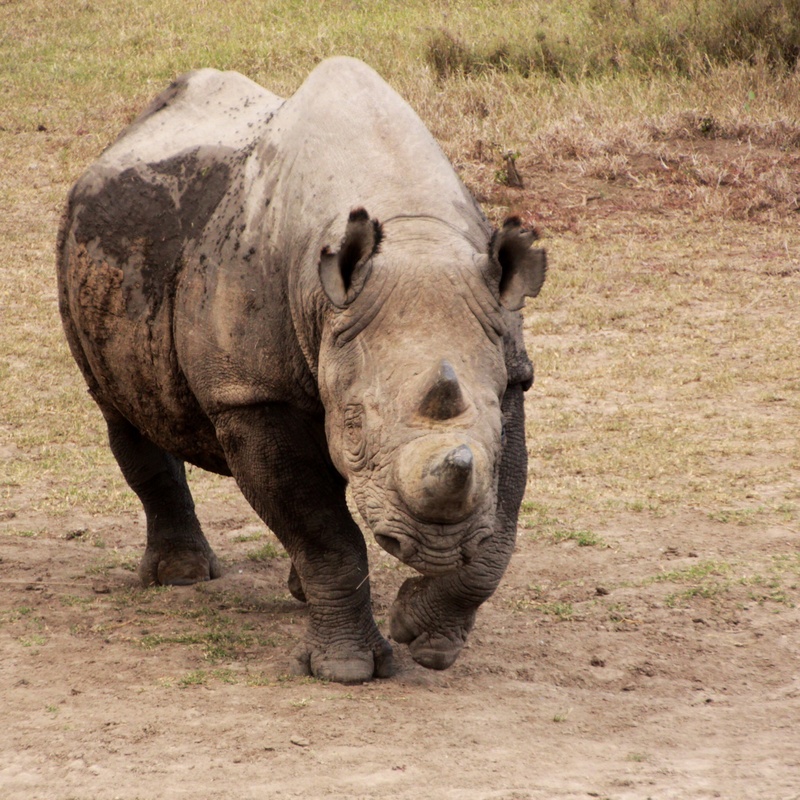 This park has dozens of rhinos, and we were fortunate to see both white and black rhinos. The rhinoceros is endangered, because of poaching for its ivory horn. A fully grown rhinocerous weighs about 2 tons, and to cut off the horn, poachers kill the animal. There would be no poaching if there weren’t a market for ivory and a price worth taking the risk of poaching. But here was Baraka, one eye missing a result of a fight with another rhino and the other eye rendered blind as a result of disease – and yet his life preserved. The point of his horn cut to reduce the value for poachers, then placed in an area where he is guarded. We are living and walking amid great contrasts. In many ways, we see how life has little value. We hear the reports of tribal violence (In the media, you hear it reported as Muslim terrorists – but it is more complicated than that. There are reasons why advance warnings of attacks go unheeded as one tribal group attacks another.) We see the harsh and frankly, inhumane living conditions all around us. Try living on two dollars a day for an entire family! The hopelessness devaluing all of life. And yet, we also see valiant efforts by persons within Kenya and persons outside this country giving resources to championing life and providing great effort to say even one life has value. Your giving allows you to proclaim the value of life and to stand here as a co-Creator with God. In God’s hand is the life of every creature and the breath of every human life. Amen. On Monday, we visited a project that Messiah funded through our 2012 Christmas offering. I will admit that I take water for granted. I assume there is more than enough water and every bit of it clean enough to drink. Maybe one needs to live in a region of the world where that is not the case to fully appreciate Jesus’ words – “I am the living water.” On Monday, we visited Nyarigano Primary School. It was about a 15 minutes drive down a bumpy, dirt road. Fortunately, it had not rained since Friday or I’m not sure the car in which we were riding would have made it on the dirt roads. We arrived during the lunch break. 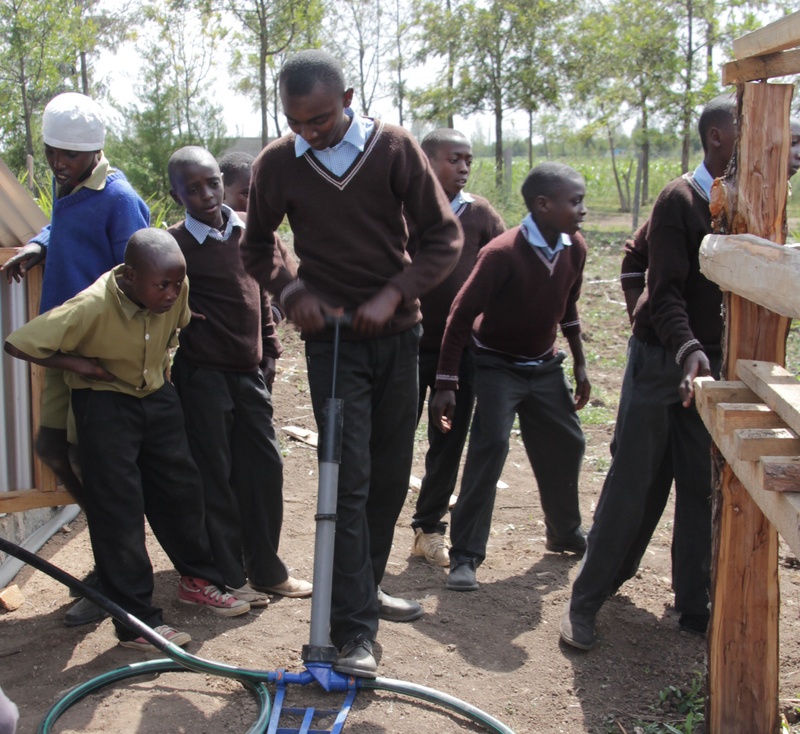 With us were staff persons from the Kenya Rainwater Association, a non-profit that works with schools, farmers, and small communities to utilize rainwater for personal needs and irrigation. Much of their funding comes from sources in Europe. Together, Messiah (through our US partner, H2O for Life), Kenya Rainwater Association, and the local community, we have constructed a system to collect and store rainwater for drinking, food preparation, hand washing and irrigation. We have also funded 18 latrines that are currently under construction. This partnership includes parent participation so that there is a local investment and a sense of ownership and responsibility for these resources. Persons on three continents have come together to make this happen. Sometimes it takes a world to make a village. There are moments in this trip when I wish all of you were with me. You are the ones who should be honored and thanked. As we arrived, the entire school gathered in the area between classrooms. Amanda and I along with two of the girls from Imara that we brought with us and the staff from Kenya Rainwater Association were seated in chairs before the student body. We were welcomed, a teacher offered a prayer of gratitude, then each teacher introduced him or herself. After each introduction, the students applauded. Then each guest introduced him or herself. I described you as a people with a heart to help others around the world, a people who have been blessed by the opportunity to give and to serve. A small group of students provided a song and a dance. Then I presented gifts: soccer balls (prompting a cheer), pencils, books, bars of soap (a visit by others from Messiah three months ago included a hand washing demonstration), and perhaps most importantly over a thousand sanitary pads (applause by the girls and snickering by the boys). Don’t underestimate the importance of sanitary pads for families unable to afford such things. Often school is missed during a girl’s period each month or we were told how girls often resort to using corn cobs in order to remain in school. The staff person from KRA was most impressed that you would provide such items. The program ended and we were given a tour. 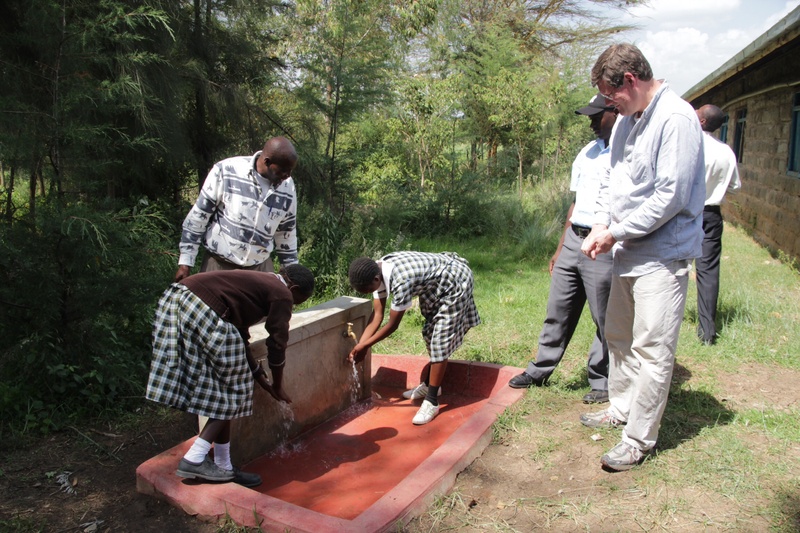 The head teacher was extremely proud of what he could show us, even demonstrating the hand washing himself, wanting us to see the first hole dug for the latrines, and then demonstrating for us how the garden is irrigated from a system that collects rainwater. The garden is maintained by the students with the produce supplementing the school lunch. One teacher took me aside to show how they are growing trees from seeds and then selling the trees to earn money for the school. 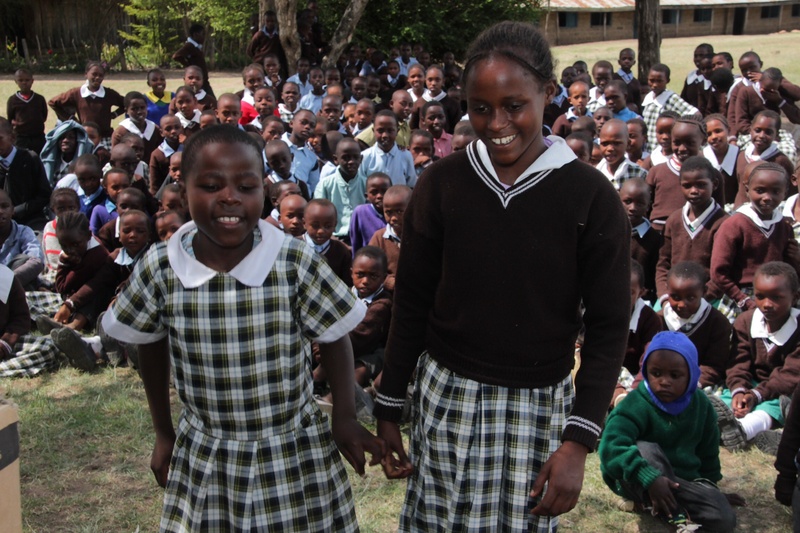 Kenyan children are provided schooling through the 8th grade as long as a family can afford the cost of the school uniform. But each day, we see many children who are not going to school. And a postscript to our visit: as we prepared to leave, the teacher of disabled students began describing the children in his class. His plea was for help so that a child who cannot hear could receive a hearing aide. Sadly, we had to tell him we could not meet that need. It is a reminder that the needs are great. Everywhere we turn, there are needs and prayers that so far have gone unanswered. And on this day, we could not provide an answer for them all. But we could do something – and in the name of Christ, you have. From several websites that I checked about 80% of Kenyans are Christian (a third of these are Catholic), 10% are Muslim, and the other 10% comprise other religions or no religion at all. But just as in the US, it is not as simple as the numbers indicate. 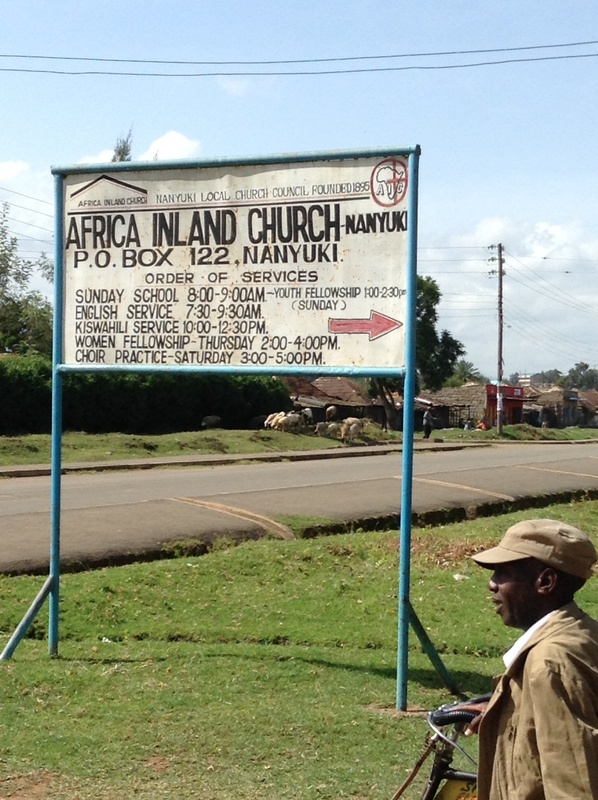 We walked through town today (yes, mzungu walking) and it appeared more people were not walking to church than were. With church windows wide open and amplification at full volume, the sounds of praise and worship sometimes felt like a competition to see whose message is the most overpowering. We walked past a large church of no particular denominational affiliation and it was silent even though throughout the week we heard singing and preaching filling the marketplace from that building. With the marketplace silent, that church is silent. In this town, we’ve seen churches that are part of denominations that we would recognize, a mosque, a Sikh temple, and buildings and tents clearly Christian but without any affiliation. We’ve listened to comments by whites and Kenyans, and it’s complicated. This morning, we attended the African Inland Church (a denomination indigenous to Kenya originating in the mid-twentieth century). At the end of the service, I was introduced to the pastor (also Pastor Steve) as a pastor and immediately he invited me to preach next Sunday. I’m not opposed to doing so (their early service is in English), but it doesn’t feel right. I’m a mzungu – and what right do I have to preach to Kenyans? Especially when we learn more about the divide between whites and blacks. They appear to live in two different worlds with a great lack of understanding about each other. Last night as our tuk-tuk driver took us home, we discussed his experience earlier in the day when he was stopped by the police. In his three years as a tuk-tuk driver, it was the first time he was stopped. He was told that he did not have a valid license and it was taken from him. The police demanded that he pay to get it back – an amount that he did not have because he had used all he had to take his young daughter to the hospital the night before. He told me that the police noticed that he was transporting mzungus and therefore he must have a lot of money. We described this to our host this morning and she responded with disgust at how the authorities act. Why are mzungus not in churches? What if you were identified as wealthy simply by the color of your skin? What if you were immediately charged more for everything because of the color of your skin? What if your response to mercy as a part of the church was used in other ways and taken advantage of as a result of the assumption that you are just plain wealthy? How long would you remain within that church? And to be fair, the mzungus have immediate assumptions about the Kenyans that they cannot be trusted and are quick to take advantage. I’ve not experienced open hostility, but I cannot shake the fact that I am mzungu. I want to say to Kenyans that I’m not like other mzungus, and I want to say to mzungus that I’m not like other Christians. You see, it’s complicated. The religious scene is complicated. The acts of terrorism by Islamic militants from Somalia have increased the tension between Christians and Muslims. I’m told that Muslim men no longer wear traditional clothing on Fridays (the Muslim day of prayer) and the women who continue to wear hijab risk harassment. And often what one finds in Christian worship (particularly in the tents or unaffiliated churches) where the pastor is self-identified as “prophet” is a prosperity gospel where a commitment to the way of Christ includes a promise of healing and riches – and yet the only one who appears to reap the reward is the “prophet”. It’s complicated, you see. On the surface, the message of Christianity is seen and heard everywhere, but it is far more complicated that it seems. Even our own United Methodist denomination has withdrawn financial support from east Africa because it cannot be determined where the money ends up. This week I’ve been reading Eugene Peterson’s autobiography. Peterson is the author of The Message version of the Bible. He states that the church ought to be “the place where dignity is conferred”. 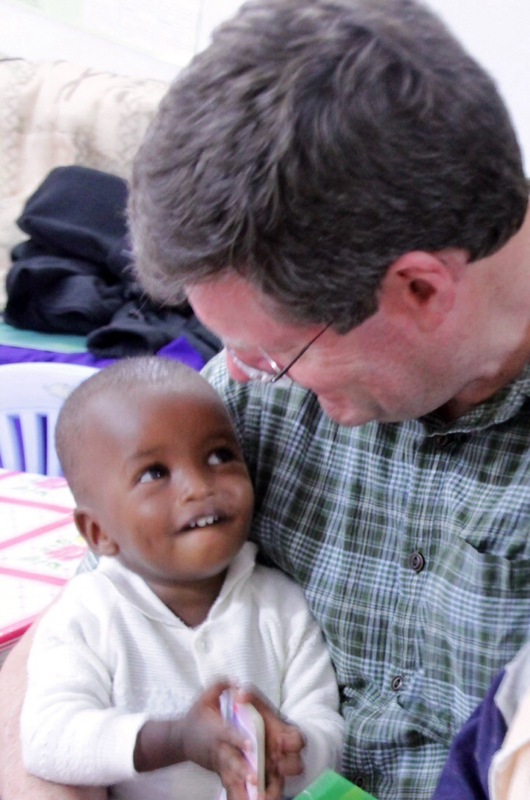 What if the church was the place where you could count on each person being treated with dignity – mzungu and Kenyan? In my time as a pastor, I have longed for the church to be the place where love is unconditional – the place where there is no judgment, just love. We do not bring change into anyone’s life, but we can love – and love in such a way that each person is opened to the God who brings the kind of change that is necessary for the Kingdom of God to be found on earth as it is in heaven. Maybe I need to preach next Sunday after all. Since most of you have not visited Imara, let me provide an introduction. 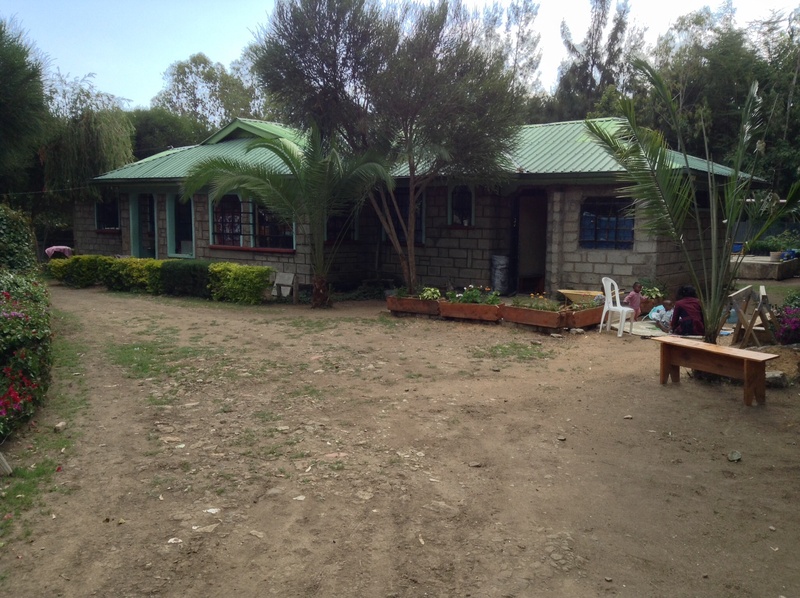 We are staying at a guest house a kilometer or two south of Nanyuki. As we into town, I am reminded of the farming communities of my childhood. The main highway is lined with shops and cafes. Instead of the pickups from my childhood, there are land cruisers and great many boda bodas (motorcycles). The traffic is constant with a great cloud of dust when a truck lumbers along the highway slowed by speed bumps and massive potholes. If it is early morning, we can see to east the top of Mt. Kenya. Most of the day, the mountain is covered with clouds. The road leading to Imara is a couple of kilometers north of Nanyuki. We turn on a dirt road (most roads are dirt roads or mud roads when it rains) and go about 100 yards to an intersection where there is what I call a convenience store – a small shack (4 by 6 feet) where someone is selling a few fruits and vegetables. We turn right on a road with the kind of potholes that would keep us Minnesotans from even driving on the road. The first gate on the left is Imara. Security is essential in a country with such extreme poverty. There are several lines of defense: a front gate that is chained and locked, another fifty feet and a solid gate connected to a perimeter lined with tall thorn bushes that are nearly impenetrable, then a fence topped with barbed wire and motion detectors that shine lights on anyone who overcomes the other lines of security. At night, a guard roams the compound. Inside the house, a panic button would sound an alarm – and a cell phone to call for help if it ever came to that. Once inside the compound, you would see a place of refuge, a place a tranquility from the harsher, busy world outside. You would hear the sounds of chickens and the laughter or cries of young children. Immediately, you would be greeted by Oscar, a female german shepherd, who would smother you with kindness. And if you get close enough, the two “guard” geese would also announce your arrival. The path to the house is lined with beautiful blooming bougainvillea. To your left is the chicken coup with hens for eggs and another coup with hens that once large enough will be eaten. Also to your left is a storage shed that was recently added. To your right is the Imara house and beyond the house is a garden that provides some vegetables. There are two water tanks – one that collects the rainwater from the roof and the other that collects water that comes from town – when it comes (nothing in this country is for certain). The house is built on a cement foundation. The walls are brick and a metal roof. There is not an inch of the house that is unused. It is amazing that the household can manage 9 girls, 7 babies, and four staff who all live together. I catch myself thinking up words to the old Brady Bunch television theme song: “here’s a story of an American named Carol who came to Kenya… (still working on the middle part) and together they became the Imara House!” It is extremely cramped for space, but somehow it works. Most of my life, I’ve lived with women without the benefit of another male presence (even our dogs have been female), so I pray daily for my friend, Pastor Reuben, who lives with 12 women and 7 babies! Bless you, Reuben! The day begins early and is structured to accomplish meal preparation, baby care, schooling, and chores. A teacher arrives from town and together with teacher Jayne who lives in the house (Reuben and Jayne are the Kenyan house parents) mornings and afternoons are consumed by school. One of the great joys for a visitor is to assist with baby care (most are now toddlers). Even better, diaper changing is the responsibility of the moms. A cook arrives to provide the noon meal and begin preparation for the evening meal. There is an L-shaped common space that provides a small area for the children’s table and a larger area for two tables for school and meals. At the evening meal, the children are served first, then the moms, staff, and visitors are seated. Food is served family style by Carol, a prayer is offered and as we eat each person has an opportunity to describe highs and lows from the day and answer the question of the day. We are at the equator (in fact, our host told us the equator probably runs through the guest house where we are staying) which means 12 hours of daylight and 12 hours of darkness 365 days a year. Daytime temp has been in the mid 70s and nights in the 50s. Each morning, I awake and say to Amanda, “Another morning in paradise.” It feels that way. Though the challenges in this country are great. There is much uncertainty about the present, much less the future. There is political unrest. The gap between rich and poor is enormous. The treatment of girls is far behind what we would consider fair and just. 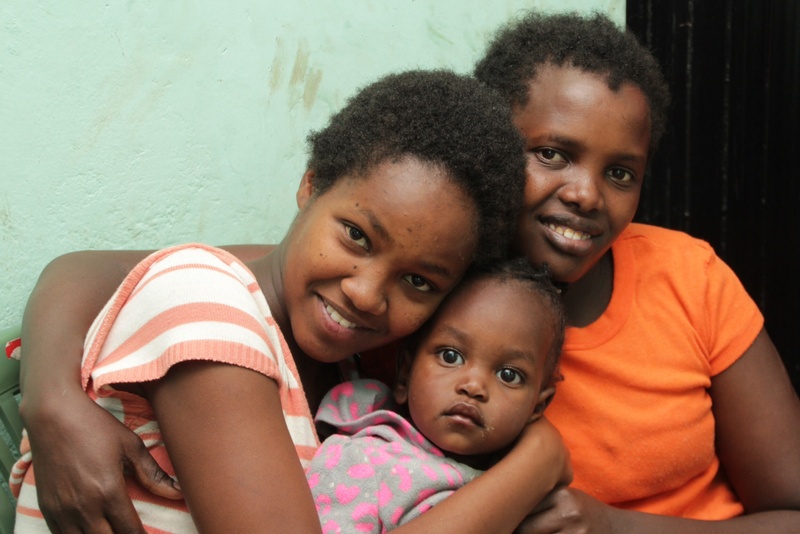 The stories that we have heard about traditional ways are difficult to comprehend – but it is changing, ever so slowly thanks to programs such as Imara. Each day, I give thanks for those of you who have opened your hearts and offer your prayers and resources to make this ministry possible. This morning, what comes to mind is the promise of John 1: In him was life and that life was the light of all people. The light shines in the darkness and darkness has not overcome it. Thank you for allowing the light to shine through Imara. I see it in the faces of 9 young women who have been given hope and 7 young children who have a chance to begin life in the presence of the Light. So today we went walking. 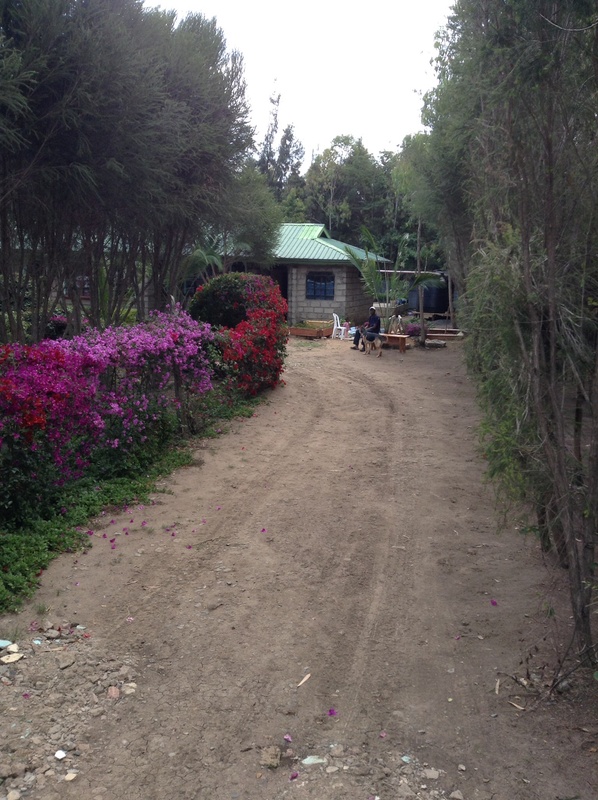 We are staying in a cottage about 2 kilometers from the heart of Nanyuki. It is a town of maybe 45,000 people, though from the main highway that runs through town, it appears to be a small town. But then, it is very densely populated with many people in very small (often 1 room) homes. We walked down a dirt driveway to another dirt road. There are many things a person can only notice from the slow pace of walking. One thing I noticed was that there were no other mzunzus (white people). We walked by a place where someone was making furniture. He looked up, saw us, laughed and began to sing with words we could not understand. After we had passed, the singing stopped. We never felt unsafe, just awkward. Everyone stared at us. We greeted those we passed – “jambo”! And a couple of times there was a tentative response. We walked past a primary school. The children in the playground ran to the fence and waved. “Mzungo, mzungo!” they cried. I waved. Persons walked past us and then turned around to look at us. Cars slowed and drivers looked our way. I began to wonder if the newspaper headline might in fact be – MZUNGU WALKING! 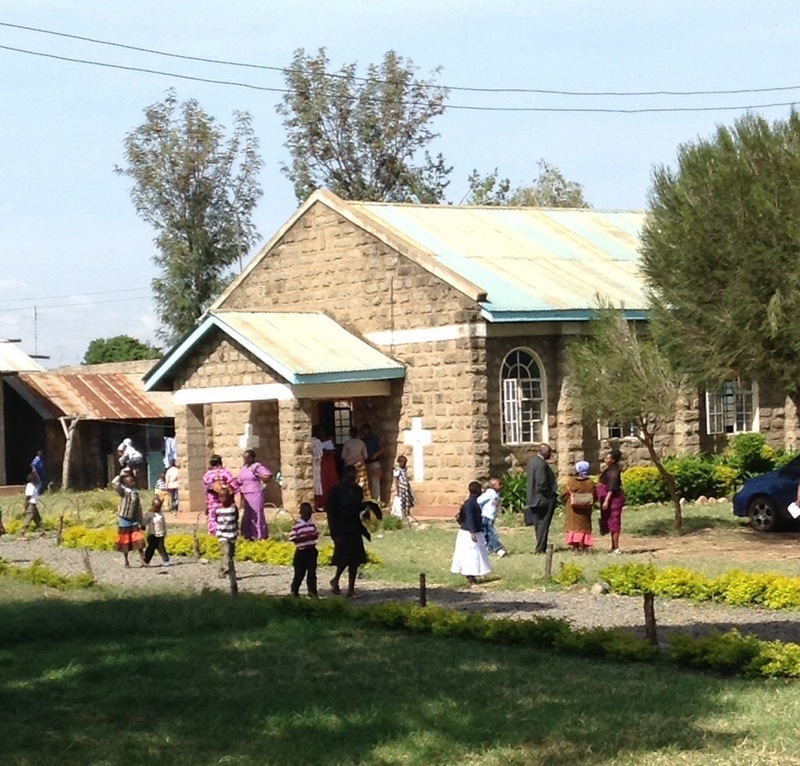 How does one choose a church to attend when in Nanyuki? My one hope was that I would understand what was spoken (at least some English). We decided to try the Methodist Church. In Kenya, the Methodist Church is part of the British system and not the United Methodist denomination. We hired a tuk-tuk and guessed correctly – 10:00 a.m. and an English speaking service! It was exactly 10:00, and we were among the first to arrive. We were greeted and then took seats near the back. We were quickly ushered from the back to the front. What followed was a 3 hour worship experience that seemed far shorter than that. A quartet of young adults had already begun singing, alternating between swahili, english and meru (the local tribal language). As children arrived, they were seated in the choir loft. Soon the children were invited forward, and the church prayed over the children before they moved to the children’s church. Our first hour was mostly singing, led by a variety of singers and a keyboard. We were reminded several times that we were singing to the LORD. At one point, all of the men came forward to sing. Then the youth came forward to sing. The choir came forward to sing. The visitors were asked to introduce themselves (and fortunately not ushered forward to sing!) which gave me an opportunity to look at those seated behind me. To my surprise the sanctuary was filled, and we were the only mzungus (white persons) present. Each visitor was applauded. We estimated 150-200 adults in attendance. Later, I was told that about 300 persons are counted as members. Songs and scripture were projected on a screen. There were a few songbooks, handwritten and handmade – in Meru, I assumed. Scripture was read in English, three readings – Isaiah 42:1-6, Philippians 2:1-11, John 13:1-6. Although it was Pentecost Sunday, the theme was disability awareness. The pastor (called the superintendent minister of the circuit) was out of town. The special education teachers from the congregation were leading worship; the guest preacher was a counselor and therapist. For the third hour, we heard two powerful messages about how all people are special, even those with disabilities. The speakers spoke against the view that disability had anything to do with a lack of faith, that families should acknowledge the existence of a child with a disability (reference was made to some areas where a child born with a disability is killed and a recent news story where a family kept a disabled child chained to a tree and treated like an animal). This was a moving message, bringing many to tears. The church was challenged to be those who would lead the way for justice and seek out the special ability that God has given to a person with a disability. At the end of the sermon, all of the special education teachers were invited forward to be prayed over. I understood only a few words of the prayer, but frankly I didn’t need to understand. This was a prayer given with such great power and emotion that it moved me to tears. We had been given offering envelopes soon after we were seated. The offering box was placed at the front and as a song was sung, each person came forward to place their envelop in the offering box. Then another basket was passed in which people seemed to place coins. The service ended with everyone saying the benediction while turning to shake each other’s hands. 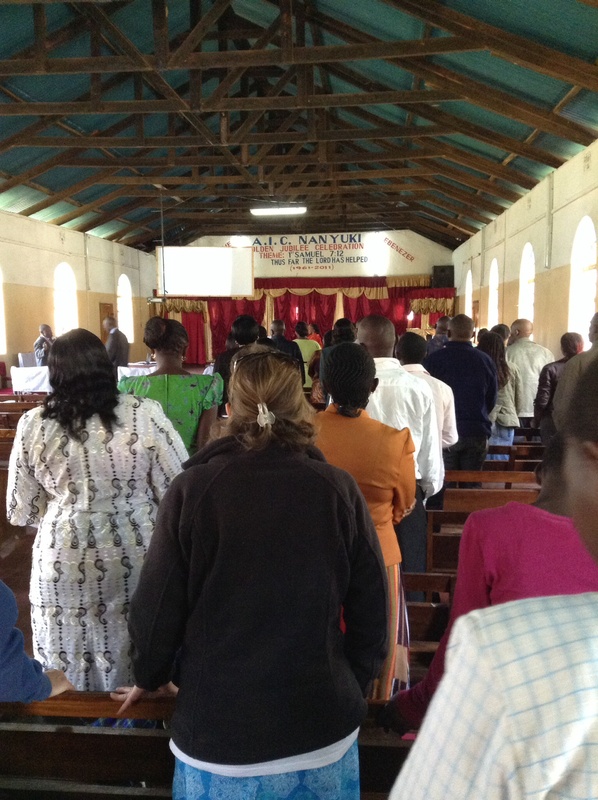 Then we sang a song in swahili and exited the sanctuary with those in the front, the first to leave (there ought to be some perk for sitting in front!). As persons left the sanctuary, we shook hands with those who left ahead of us and then formed a line to shake hands with those who followed. Amanda and I were quickly greeted by the secretary of the congregation who invited us to tea. We were lead to a small room with a table. It turns out that guests are given dinner. A few leaders of the church were present and the guest preacher’s family. We were served a meal of rice and beans with a cup of tea. We made a few connections with people who promised to call us. The secretary (Moses – a biology teacher at the secondary school) offered a tour of the grounds. The church has a primary school through class 8 for 282 students. They are building a dormitory for students in class 5 and above. I found it impressive what this church of 300 was accomplishing. And the message of justice was as compelling as any I have heard. I have been to church today. Our worship may not have referenced the day of Pentecost, but I experienced the outpouring of the Holy Spirit in a way that celebrated the inclusion of all people. I had not heard the words, Immortality Project, in my prior trips to Africa. My friend in Tanzania said there are many such projects. Projects that were funded by persons or organizations after seeing a need and wanting to provide a solution. Sometimes the donor’s name is attached to the project, but not always. It’s not that the project isn’t well-intentioned or isn’t attempting to help someone. The project may save lives. In the past week, I’ve had several conversations with persons in the mission field who have shared a similar frustration even when they have not used the words, Immortality Project. Let me explain. 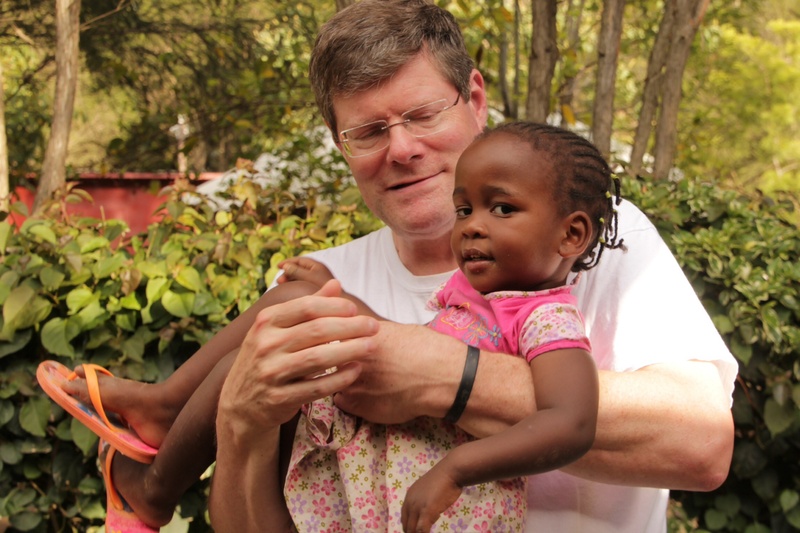 Let’s say that a person from the US makes a trip to Africa and sees the dire needs of the desperately poor. I’m going to do something about this, the well-intentioned person says. Health care is lacking and so the person wants to make a hospital or at least a health clinic possible. Funds are raised and given and the clinic is constructed. The project is dedicated and soon the clinic begins seeing people. Suddenly, the desperately poor have somewhere to turn. Two problems emerge – there was no plan for how the clinic would be funded longterm or become self-sustaining, and no one took the time to determine whether the clinic was the significant need that needed addressing. And the desperately poor, though now with some health care, are still desperately poor. In his book, Toxic Charity, Robert Lupton writes: “Mercy that doesn’t move intentionally in the direction of development (justice) will end up doing more harm than good – to both giver and recipient.” To better understand what he means, I encourage that you read his book which I completed this week. I am reflecting on the words of Micah 6:8. “[the LORD] has shown you what is good and what does the LORD require of you but to do justice, to love kindness and to walk humbly with the LORD.” In some translations, it is “mercy” in place of “loving kindness”. The Hebrew is “hesed” – mercy. We see or hear something and mercy tugs at our hearts. Mercy also becomes a window to the heart of God. But mercy is short-term and without justice, without a longterm plan, the needs becoming overwhelming. Justice also needs mercy so that heart and head work together. Add humility and God’s greatest work can be accomplished through us. In Acts, when Peter and John encounter a lame man who begs for money, they do not give any money. Instead they give something greater – healing. It is the gift that brings long lasting change. That’s justice. And given in the name of Jesus – that’s humility. Every day that I’ve been in Africa, I have been approached by someone asking for help. Today, it was a woman in the marketplace who was begging. We didn’t give money but a carrot after her plea that she was hungry. But then she begged for us to take her with us and when that failed, pleaded that we not forget her. There is a heart-wrenching moment everywhere we turn. My mercy meter is working overtime! We could give money, but is that justice? We could give money to an organization, but is that mercy? I don’t have the solution, but I want to do more than offer a bandaid. Henry Blackaby writes, “Find out what God is up to and get in on it.” I met a nurse two days ago who moved to a remote area of Kenya to start a clinic. His advice to me: Enter a community and spend time getting acquainted with the people and God will show up. Do that and you will begin to see miracles happen that equal anything you’ve read about in the Bible. Micah says: the LORD has shown you what is good.